LG Electronics’ mobile payment service LG Pay will be used for low-budget smartphones next year, the firm’s mobile communication division head said. The service will also be expanded into online shopping malls and in the global market as its rival Samsung Pay offers. 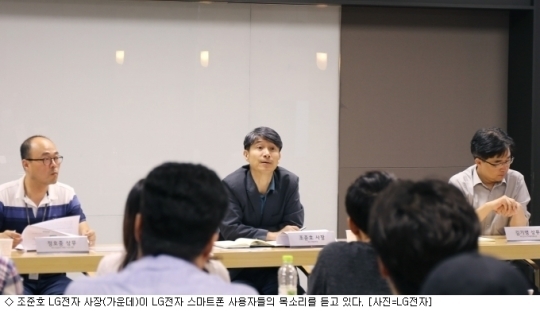 “We will expand the use of LG Pay into low-budget smartphones alongside premium phones next year,” Cho Jun-ho, president of LG’s mobile communication division said during a meeting with local bloggers on Friday. LG Pay is a mobile payment service which allows users to make a payment in stores by placing their smartphones on the card reader, making it unnecessary to carry physical cards. LG Pay was launched on June 1 alongside G6 series with the aim of catching up with Samsung Pay, which dominates the local mobile payment market since its rollout in August 2015. The latecomer is now available for only LG G6 series, offline stores and in the domestic market while Samsung Pay is available for Samsung’s 12 devices, both for online and offline stores and in the 14 nations. During the month of June, the number of LG Pay users stood at 95,000, compared to Samsung Pay’s 5.2 million users, according to local research firm Wiseapp. Cho said the use of LG Pay will expand into online stores and the global market, although he did not elaborate the specific date. The firm can’t fix the date as it needs to address technical issues with financial companies, LG said. Industry experts said it is important to expand partner stores to increase user bases but it should be carefully done based on consumer demand. “The users will naturally increase when the service is available in more areas. However, the expansion should also be based on consumer demand and patterns considering the costs required to develop, operate and maintain every new system,” Kim Jong-dae, a researcher at LG Economic Research Institute, told The Korea Herald. Analysts are optimistic about the growth potential of the mobile payment market. It jumped fivefold over the last four years to 35 trillion won ($31 billion) in 2016 from 6.6 trillion won in 2013, according to Statistics Korea. The sales generated from mobile shopping also exceeded the sales from computers for the first time last year in Korea. The sales from mobile shopping jumped 45 percent to 35 trillion won year-on-year, according to Korea Online Shopping Association.